Researchers from the Tubbataha Management Office (TMO) and Philippine-based marine conservation NGO the Large Marine Vertebrates Research Institute Philippines (LAMAVE) have deployed the first ever satellite tag on a tiger shark in the Philippines. The team attached a wildlife computer SPOT-6 dorsal fin mount to a 3.36m female tiger shark. 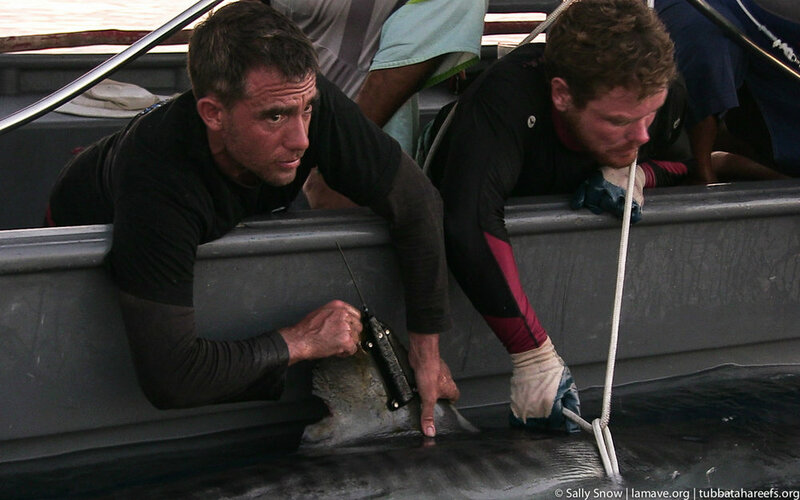 The tag, which is attached to the dorsal fin of the shark, will transmit to a satellite when exposed on the sea surface, giving researchers information on the near-real time movement of the shark. The team also fitted another 3m female tiger shark with a Vemco V16 acoustic tag. Contrasting to the fin mount, the acoustic tag will send “pings” to carefully positioned acoustic receivers in the park – revealing the local movements and habitat use of the individual tiger shark within the park. Four grey reef sharks were also tagged with acoustic tags before being released. The project is a collaborative effort of many organizations. Led by TMO and LAMAVE, the team also included scientists from the Marine Megafauna Foundation and the University of Victoria, Canada, and James Cook University, which provided the first batch of acoustic receivers. The ground-breaking research expedition is an immense step for shark conservation in South East Asia and the Philippines - a country that lies at the heart of the coral triangle. Overfishing and habitat destruction has seen millions of sharks disappear from the Coral Triangle – a place defined as the center of marine biodiversity. Protected areas such as the Tubbataha Reefs Natural Park, which was declared a UNESCO World Heritage Site in 1993, are critical for the survival of these apex predators. Data collected from the tiger sharks will shed light on the movement of these animals, helping to answer critical questions such as where the sharks are going and whether they are spending time safely inside the boundaries of the park. Or if they are venturing into unprotected waters, where they may be at great risk. Protected areas like the Tubbataha Reefs Natural Park, which offers critical protection for apex predators such as sharks, could be one of the answers to helping repopulate the decimated shark populations of the Coral Triangle. Tubbataha Protected Area Superintendent, Angelique M. Songco, said For our own good, the sharks need us to survive - and we need to work together to ensure that they do.